Electrolux is partnering with Drop, a smart kitchen technology company, to further develop the smart kitchen ecosystem. Based on this partnership, Electrolux business area Home Care & Small Domestic Appliances will enable products to work seamlessly with Drop’s online platform and app, which will provide tailored recipes and guidance to the specific programs and the capabilities of Electrolux appliances. Using the latest technology to simplify and personalize the consumer cooking journey through assisted cooking, new services and partnerships is a growing area of interest for Electrolux. 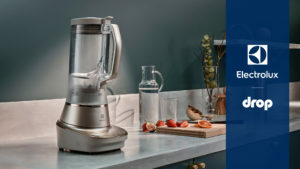 Earlier this year, Electrolux announced several strategic partnerships within the smart kitchen, such as with the eating technology company Innit in Europe, the recipe platform SideChef in Asia Pacific as well as expanding its collaboration with the Google Assistant to Europe. “We’re excited to partner with Drop and to further explore new ways of making the cooking experience more simple and personalized for consumers – said Ola Nilsson, Head of Electrolux business area Home Care & SDA -. By partnering with Drop, we can further expand our connected ecosystem to deliver great cooking experiences to consumers”.